For Alaska, all station identifiers start with "PA;" for Hawaii, all station identifiers start with "PH"
The UTC valid period of the forecast consists of two four-digit sets, separated by a "/"
SKC . . . . . . . . . . . . . . "sky clear"
SCT005 BKN025CB . "five hundred scattered, ceiling two thousand five hundred broken cumulonimbus clouds"
VV008 . . . . . . . . . . . . "indefinite ceiling eight hundred"
Wind shear is the forecast of nonconvective low level winds (up to 2,000 feet). The forecast includes the letters "WS" followed by the height of the wind shear, the wind direction and wind speed at the indicated height and the ending letters "KT" (knots). Height is given in hundreds of feet (AGL) up to and including 2,000 feet. Wind shear is encoded with the contraction "WS," followed by a three−digit height, slant character "/," and winds at the height indicated in the same format as surface winds. The wind shear element is omitted if not expected to occur. WS010/18040KT − "LOW LEVEL WIND SHEAR AT ONE THOUSAND, WIND ONE EIGHT ZERO AT FOUR ZERO"
EXAMPLE: OVC012 BECMG 0114/0116 BKN020 − "ceiling one thousand two hundred overcast. Then a gradual change to ceiling two thousand broken between 1400Z on the 1st and 1600Z on the 1st"
EXAMPLE 1: SCT030 TEMPO 0519/0523 BKN030 - "three thousand scattered with occasional ceilings three thousand broken between 1900Z on the 5th and 2300Z on the 5th"
EXAMPLE 2: 4SM HZ TEMPO 1900/1906 2SM BR HZ - "visibility four in haze with occasional visibility two in mist and haze between 0000Z on the 19th and 0600Z on the 19th"
EXAMPLE-PROB40 2221/2302 1/2SM +TSRA "chance between 2100Z and 0200Z of visibility one-half statute mile in thunderstorms and heavy rain." PROB30 3010/3014 1SM RASN. 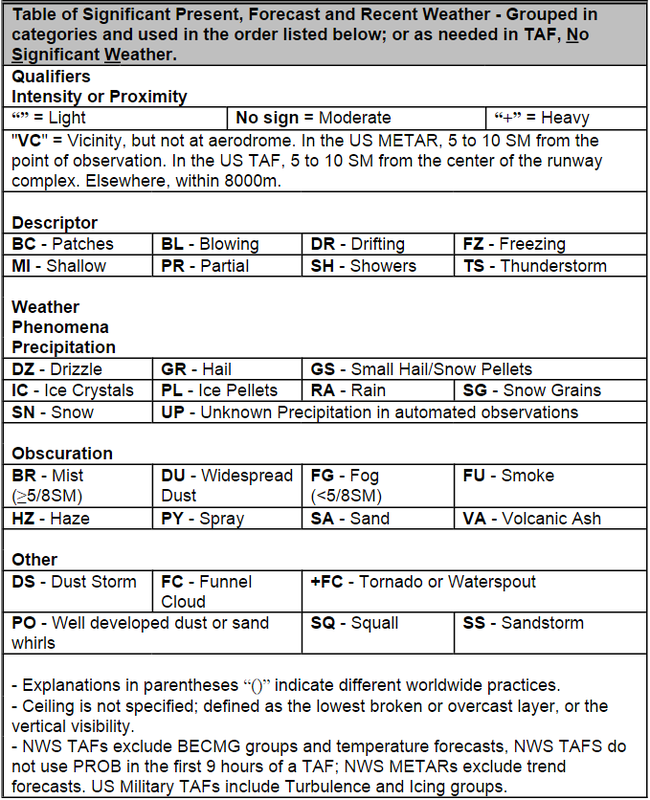 "chance between 1000Z and 1400Z of visibility one statute mile in mixed rain and snow"